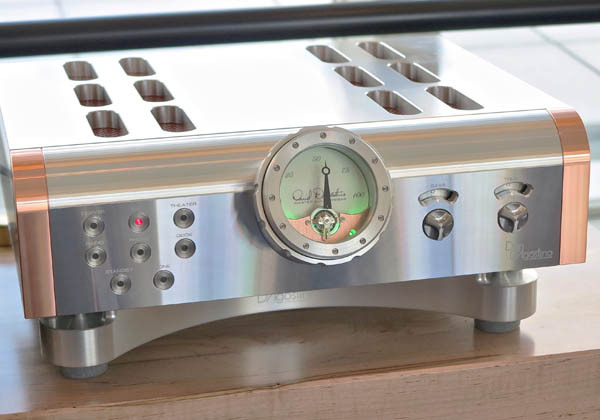 Illinois dealer F1 chose the sonically challenged, glass-encased Nirvana Lounge, on the second floor of the Renaissance Schaumberg’s Convention Center, to stage its $428,871 crate-décor system complete with an important premiere: the Dan D’Agostino Momentum HD preamplifier. 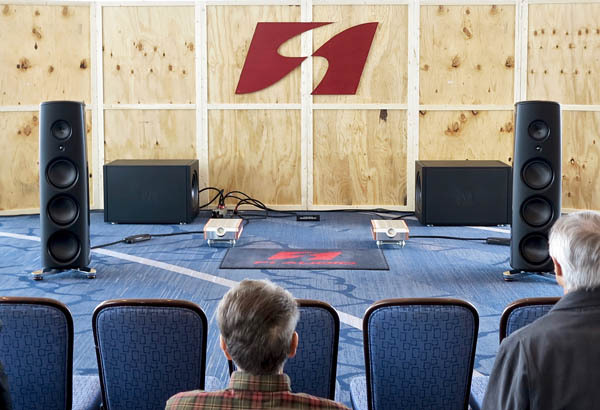 Alas, the hard sound and moderately booming bass, whether on a recording of Bach’s Suite No.1 for unaccompanied cello or some driving fusion, made for a less than auspicious start to a show where, as I soon discovered, many visitors to these huge Convention Center spaces were more interested in chatting than listening. Be that as it may, there was no question that the system—Magico’s M6 speakers ($172,000/pair) and Q-Sub 18 subwoofers ($72,000/pair), fed by the above-mentioned Dan D’Agostino preamplifier ($40,000) mated with D’Agostino Momentum M400 monoblocks ($65,000/pair), Chord Dave D/A processor with stand ($14,483) and MScaler ($4995), and Roon Nucleus server ($1398), connected by Transparent reference-series cabling ($54,000) and supported by a Mapleshade audio rack ($1995)—could fill the space with ease.